By 1989 it had been 12 years since Fianna Fáil had won an overall majority in the Dáil. The last of these was by its record-setting nature difficult to emulate in the first place, but the party's inability to form any majority at all in the four elections since then was becoming a cause for concern for its members. The election of 1989 would enhance this concern. Though the party's vote share remained unchanged since the last election, a lack of transfers resulted in a loss of 4 seats, necessitating the party's first foray into coalition. This government would last for three years until Charles Haughey stepped down as Taoiseach and party leader. Now with a chance to give itself a fresh start, Fianna Fáil elected Albert Reynolds as its new leader. He faced the 1992 election as the first "new" Taoiseach the country had had in over a decade, but Fianna Fáil was not to benefit from this. As a result of Labour's stunning results in that election, Fianna Fáil's share of the vote declined to 39.1%, their worst share ever since they first entered government 60 years previously. The party continued in government, but only with Labour's support - when the latter walked out two years later, Fianna Fáil was unable to remain in office. The next election came with another attempt at a fresh start. Former Finance Minister Bertie Ahern now led the party, and though they recovered the seats they lost in 1992, their vote increased by a mere 0.2%. Once again Fianna Fáil were in coalition, this time with the Progressive Democrats. It appeared the time of majority Fianna Fáil governments was over. Taking the party's current state in to account, the party's gradual decline since 1989 gives the impression that even had the circumstances of the past three years not happened, Fianna Fáil would still have faced a very uncertain future. Even the 2002 election, which saw the party reach 81 seats for the first time in 15 years, resulted in a growth of just 2.2%, and the share was still several points below the figures the party had enjoyed in the 1970s and 80s. It would be incorrect however to attribute this entirely to a slow decline in popularity. 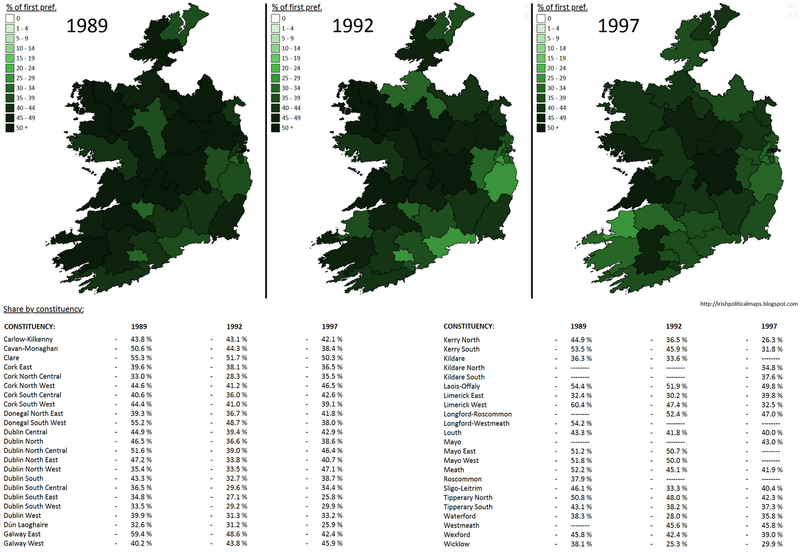 While the personal popularity (or lack thereof) of certain party leaders - not least Charles Haughey - and their administrations undoubtedly had a part to play in the party's fortunes, the late 1980s and 90s saw an unprecedented increase in the growth of smaller parties: the Progressive Democrats, the Green Party, the Workers' Party (and subsequently, Democratic Left), the Socialist Party, and a reformed Sinn Féin all contributed to an expansion in the choice available to the electorate, particularly in Dublin. This, combined with the varying fortunes of Fine Gael, Labour and Independent candidates (not least in Kerry), meant that the vote was now being divided amongst more groups, and Fianna Fáil simply could not maintain the position of dominance they had held for so long. Though no one in 1997 could have predicted what would happen in the polls in 2011, it already seemed unlikely that Fianna Fáil would ever gain back the level of support and popularity it had enjoyed at its peak. Click on the image to see it full-sized. A greyscale version will be available shortly.